Most people know New York as NY, NYC or The Big Apple. This huge conglomeration in North-Eastern USA is one of the biggest cities in the world (the biggest in the country), and houses a whole array of enticing activities for the whole family. Yes, New York is a true Metropolis, a true Met. You might have heard about The Mets, a baseball team from New York. But it is the art museum right in Central Park that attracts most visitors, and it is also known as The Met. The Metropolitan Museum of Art in New York is a masterpiece of an art collection. First of all, it is one of the biggest art museums in the world when it comes to sheer size. The humongous building is conveniently located right on Manhattan, in the refreshing Central Park, and opened its doors for the first time in 1870. Since then, the Metropolitan Museum of Art has been growing rapidly, year in, year out. Nowadays it holds both permanent collections from ancient Egypt, classical Europe, and of course more or less everything you can imagine in terms of proper American art. By the way, The Met is one of very few buildings in New York that has a classic European look. With its Victorian Gothic style, it is as much a beauty on the outside as it is on the inside. Five million visitors annually can easily testify to this. The Metropolitan mostly draws attention from art lovers across the globe, but also young kids and students will easily find their place in its giant halls. See, The Met in New York holds vast amounts of information, which any student or knowledge-seeking youth can use. Make your way through dozens of libraries and study rooms, where art is only one of the subjects available for in-depth studies. 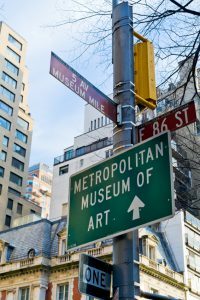 Yes, the Metropolitan Museum of Art in New York is so much more than just a museum. It is a trendsetter, a place of gathering, an oasis of knowledge and peace, surrounded by the never-ending hustle and bustle of New York, and with the green fields of Central Park as its backdrop. By the way – it is entirely up to you how much you want to pay for entering The Met, even though the “advised” fee is 25 dollars. See Caravaggio, El Greco, Goya, Rembrandt, Picasso and Demuth all in one place, or make your way up to the roof garden of this majestic museum and walk amongst modern art sculptures while sipping on some coffee.